I recently switched my primary twitter app from Plume to Fenix. On UI and features, both have their pros & cons, but Plume’s usability had taken a massive dive recently with long delays and freezes. Fenix, on the other hand is as fast as they get. Probably, even faster than Twitter’s own app! 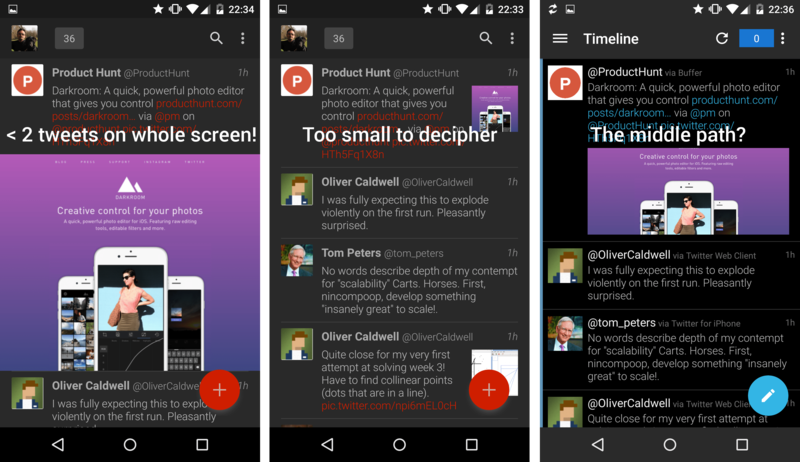 While Fenix is faster, prettier, and generally more pleasant to use than Plume, it also has a few serious drawbacks – especially for users like me, with multiple Twitter accounts. After 3 weeks of using it, I’ve even come to like some of its drawbacks (no multi-account integrated timeline – allows focus), and been desperately hunting/craving/begging for others to be removed. This post is a list of those nettlesome issues, and my suggestions on how to remove them. Currently, switching between timelines on two accounts requires: an edge swipe and a slightly problematic tap1. While this is an improvement from the earlier edge swipe + 2 taps, it’s still not fast or efficient enough. Suggested solution: Swipe on action bar to switch between accounts. 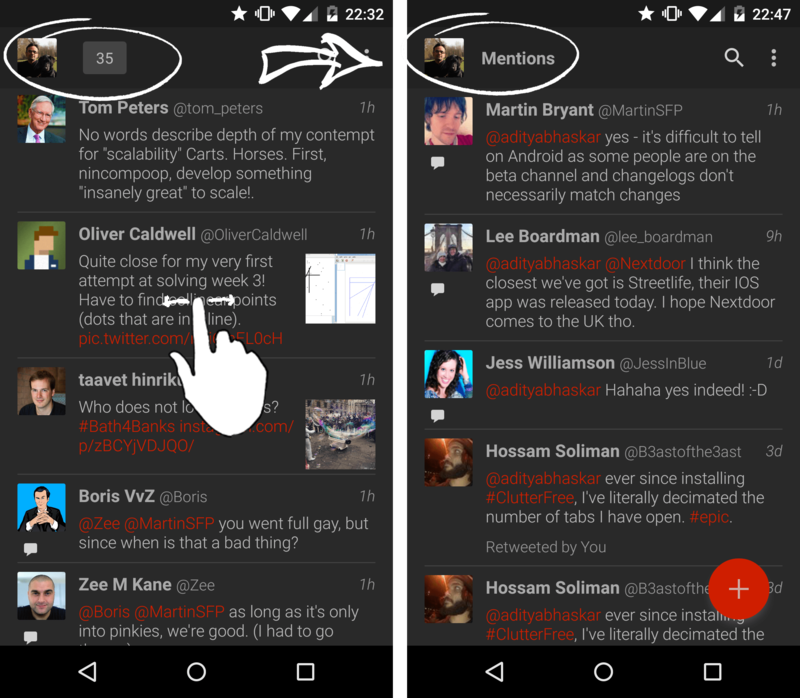 Swipe on action bar to switch between different Twitter profiles. Swiping on the list of tweets currently switches between various columns – timeline, mentions, DMs, favourites, etc. 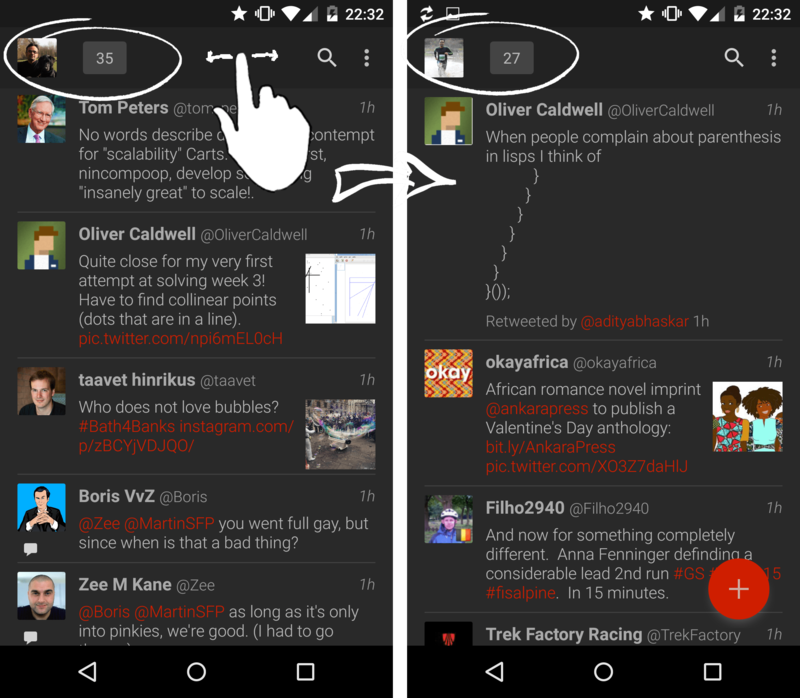 Swiping on the action bar would switch between accounts in a similar manner. In fact, this UI pattern is already used by Chrome for Android – we can switch between adjacent browser tabs by swiping on location bar / action bar2. Swipe on the list to switch between columns of current profile. The compose tweet function in Fenix is better than the timeline feature – user can start composing from either account and switch, with 2 simple taps, to another account. It also has the best integration of ‘drafts’ functionality that I’ve seen across any twitter app so far3. However, it lacks a very important feature for multi-account users – ability to post the same tweet from multiple accounts in one go. Plume accomplishes this quite well (3rd screen in the image below), and it would be really great to see a similar functionality come to Fenix. The changes requested so far are (mostly) UI tweaks that enhance experience for multi-users. The muting/filtering feature upgrade requests below, however, are highly relevant for all users. Also, of all the functionality in Fenix, this is one area where I feel it really needs to improve by quite a bit. The current implementation of muting in Fenix works by applying the set filters on new, incoming tweets. While this works for long-standing filters, it’s not very useful when you wake up in the morning to see your timeline full of tweets with a random, useless hashtag, say #ReplaceAMovieTitleWithGoat. Now, even if add a new muting rule to filter out that #tag, it only prevents new tweets from being added to my timeline. I still need to hurdle past the 100s of unwanted tweets with that #tag already in. Suggested solution: Every time the filter/mute list is updated, run the filter function on all the tweets in the current timeline. Just as it would be run on incoming tweets. My hunch here is that the filter function is being run when the tweets arrive from Twitter’s backend to the app, and only the unfiltered ones are sent for storing locally to the content provider4. For filtering (and unfiltering) of already downloaded tweets to work, the code needs to be changed so that it stores all tweets, and filters them when the content resolver/adapter4 fetches them from content provider to populate the list. 3) Create filters using regular expressions, or even clear text. Creating simple word based filters is quite straightforward in Fenix. However, that’s all it supports. There is no support for defining filters as regular expression. Furthermore, due to a possible snafu in the app code, some text-based filters don’t work either. As an example, I have been using ‘. 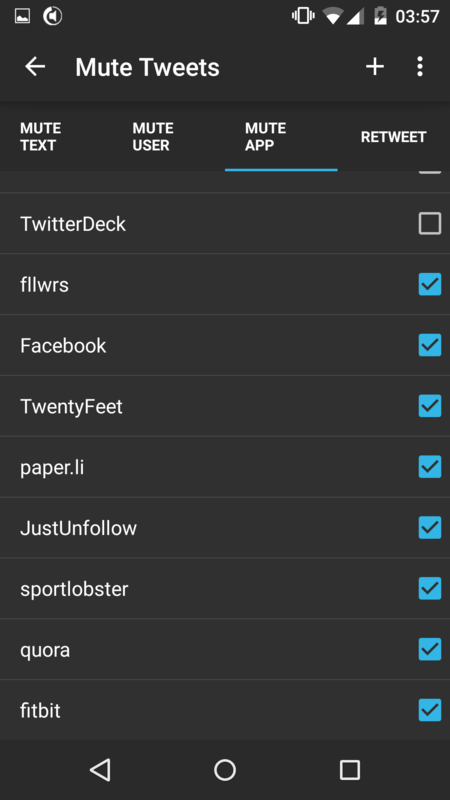 @’ as a filter for a while on Plume. This filters out the tweets that begin with ‘. @twitterhandle …’, which I rarely find useful or entertaining, on Plume. Fenix, sadly doesn’t accept either. There’s no support for regular expressions in filters. And using ‘. @’ produces a confusing result – filtering out a lot of tweets, both those beginning with, and not beginning with, ‘.@’. My guess is that the text string provided by the user isn’t sanitised by the app before being added to the filter regex in the code. 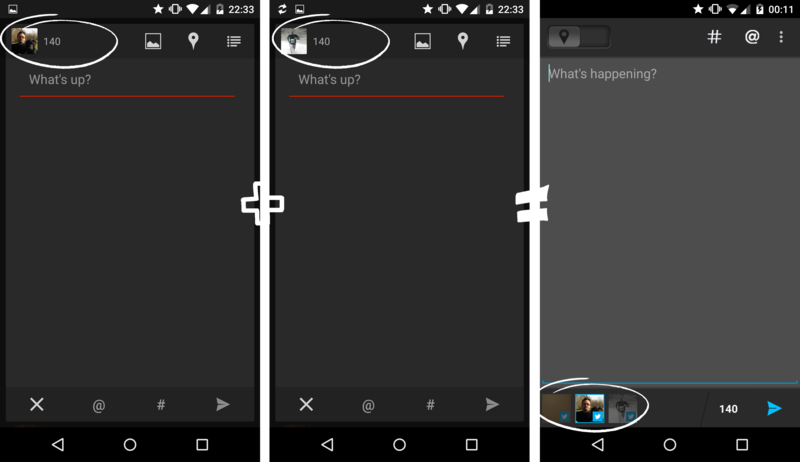 Fenix currently offers 3 options for image previews in timeline – large (left screen below), small (middle screen), or none. Image preview needs a medium/cropped option along with the current large & small ones. The large screen option looks beautiful! However, most images take up so much screen real estate that browsing through the list becomes a bit of a chore. 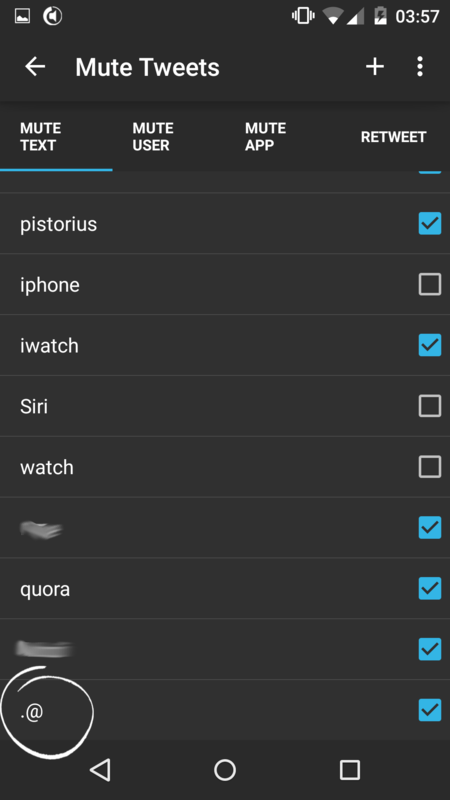 The small screen option makes the list quite nice and compact – perfect for quickly scrolling through. However, the size is so small that for most images, the preview doesn’t even offer much of a hint of the full image’s content. Result is user opening a lot more images in full view mode. full-column-width preview, cropped to a standard height. Cropping by height ensures the image leaves space for more tweets, while the full-width preview gives a much better idea of the image’s content. It would be wonderful to have a similar middle-path image preview option in Fenix.